We're fully expecting the Samsung Continuum to be announced at Sammy's New York City event on Nov. 8, but that doesn't mean the phone will be available that day. (And that's how it goes, more often than not.) But it likely won't be long after that before the dual-screen phone will be available for purchase. 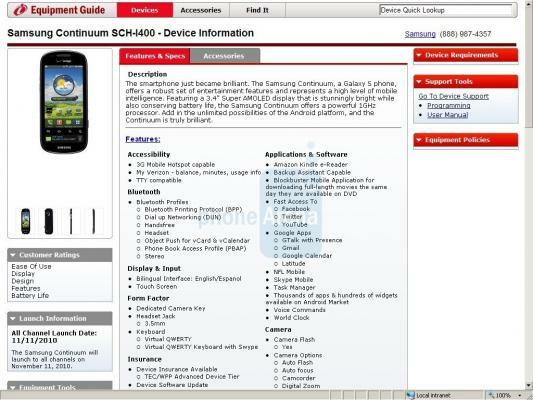 Phone Arena has a screen shot showing the Continuum available in all Verizon retail channels on Nov. 11 -- the same day that Big Red's Galaxy Tab goes on sale. You can see the leaked shot after the break, which has a slew of expected specks and answers one big question for us: The Continuum has a 3.4-inch Super AMOLED screen on the main display. In the meantime, be sure to check out our preview of the Samsung Continuum, as well as our video hands-on, and ask us more in the forums.